It’s exciting news, as The Manchester International Women’s Day Quilt, (I know, it’s a bit of a mouthful) has a new home at, (drum roll please) the People’s History Museum in Manchester. 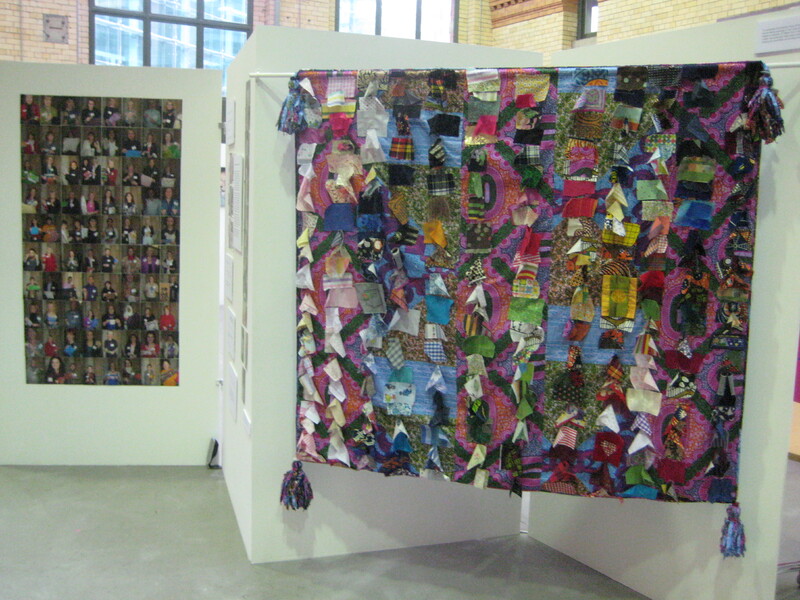 Back in 2011, The MIWD Quilt was on show at the PHM for the 100th anniversary of International Women’s Day. The inspiration to this exhibition actually started back in March 2010 when over 300 amazing people came together at The Monastery in Gorton to celebrate International Women’s Day. The key themes of that day were that small actions can make bigger things happen and everyone has their own story. The MIWD Quilt does share a bit of history with the PHM, while the inspiration, context and fabric stitched into the Quilt really do bind and bond it well to the PHM and Manchester. A bit more background detail on the MIWD Quilt can be found on my blog of an exhibition in 2012 at The Quilt Museum in York. Noticed the bra bunting in the pics? It raised a few eyebrows and elicited a few comments during the exhibition, which is all positive, as it got people interested and talking, and not just about the exhibition. The bra bunting was there to importantly highlight some useful bra recycling: find out more and get involved. This entry was posted in PHM Collection and tagged Collections, Exhibitions, International Women's Day, Quilt. Bookmark the permalink.